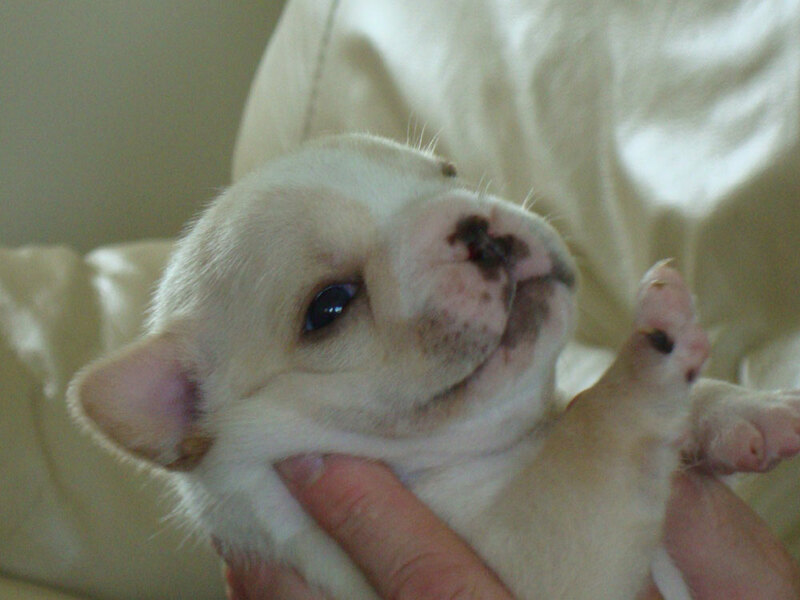 I went to visit the Butters’ babies, and discovered that somehow, over the last week and changed, they’ve morphed into from French Bulldog puppies into fat baby sloths. The bigger boy, in particular, has decided that since he has milk on tap, and dedicated humans to pick him up every time he even squeaks, that there’s just no point in walking or doing anything else that burns energy. If he’s lying on his back and you pick him up, he’s quite content to just hang there in your hand, lying on his back with his fat tummy exposed to the world, contemplating the mysteries of life. Creamsicle, aka Hammy, is happy to have you do whatever you want with him – put him on his back, hold him up in the air and make him do the Hammy Hamster dance, tickle his little toes until his belly wiggles like a bowl of jello. Lyra, as Paula has named the girl, is a little bit more ambitious – she has one goal in life, and that goal is to get you to feed her. Everything she encounters is tested and tasted, in case it contains food. She also has that adorable Frenchie need to be picked up and carried everyplace – and of course, with a face like hers, it’s hard to say no. So, Lyra spends her every waking moment shrieking until some one comes to get her, or until her mom feeds her (mostly just to get her to shut up). Butters has had just about enough of motherhood, thank you, and spends most of her time hiding in the corner and pretending that those fat little dumpling kids are no concern of hers. In this she joins the time honored tradition of her mother and half sisters, all of whom think that motherhood is basically just an excuse to hire nannies. There’s a video of the sloth babies after the cut – the upside down puppy is the bigger boy, and later you’ll see Paula making Hammy do the Hamster dance. 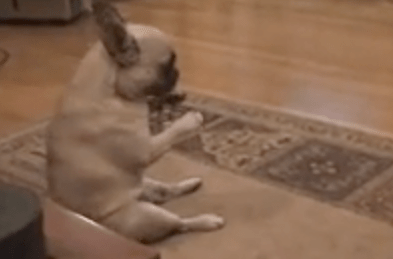 It’s amazing what you can get Frenchie puppies to do it you’re bored. Photos are below the cut, after the video, or over on Flickr. 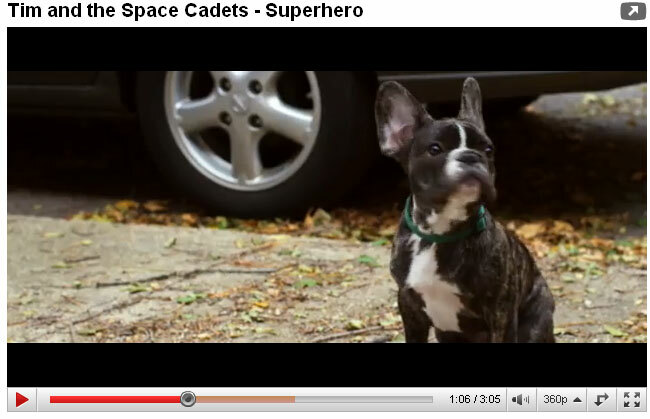 Hugo the French Bulldog is secretly the star of the new Tim and Space Cadets Video, "Superhero"
It seems that Hugo isn’t content to let his litter brother Po be the only one in the spotlight. It’s a music video for the children’s music group “Tim and the Space Cadets”. Back in October, they were in desperate need of a french bulldog for the shoot. I said Hugo was available but is just a puppy (at the time he was just about 4 months old) so not sure how much I can get him to do but they agreed to give it a try (I think out of desperation of not finding an adult frenchie…hah). But to everyone’s surprise, he was extremely obedient! He listened off leash with a crew of 15 people watching and was truly a shining star that day. No one could believe how well he listened being he was just a baby. Pretty awesome. Video below – Hugo shows up around 1:00 minute in. Just a note to the producers of the video – the only thing that would make this video more awesome? More Hugo! A few people have asked how Mae is doing, and how advanced her symptoms are. This quick video shows some of her more clearly visibly symptoms – her turned in rear legs, her habit of walking on her knuckles, the drag marks she leaves behind in the snow. More importantly, it shows her super happy disposition – and illustrates why we’re so happy to have her here with us again!